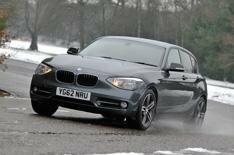 2013 BMW 114i review | What Car? The BMW 114i is a new entry-level version of the 1 Series. It's the cheapest BMW you can buy and it has a 101bhp version of BMW's turbocharged 1.6-litre petrol engine. It's available with a six-speed manual gearbox only, in a choice of four trims, and is offered as either a three- or five-door model. Prices start from 17,630. What's the 2013 BMW 114i like to drive? With just 101bhp to call on, the 114i is, understandably, far from quick. Power delivery is linear, however, so as long as you're prepared to make frequent gearshifts, you can make decent progress without much fuss. In town, the 114i feels perfectly nippy; it's only when you're pulling lower revs at higher speeds that the engine feels laboured. At the legal limit you often need to shift down to maintain momentum, and even then it can take a while to pick up pace. Given that many 1 Series are run as high-mileage company cars, that's a problem. The 114i's engine sounds a little gruff at start-up, but once on the move it's smooth and quiet. Even when worked hard, it doesn't get boomy. Engine apart, the 114i is like any other 1 Series to drive. Our car was in Sport trim, which means standard suspension and, as a result, a generally comfortable ride. Despite BMW labeling it a 'Sports Hatch', in this guise the 1 Series isn't any more fun than most of its rivals. The handling is well balanced and there's plenty of grip, but the light steering is unsatisfying at speed. What's the 2013 BMW 114i like inside? As with any 1 Series, the appearance of the 114i's cabin varies considerably depending on trim. This engine can't be combined with M Sport trim, but there's the choice of ES, SE, Sport and Urban models, and a range of interior packages that allow you to choose various materials and colours. However it's specced, the 1 Series' interior is well built and uses much of the same switchgear as BMW's pricier cars, so it's fairly classy overall. Some of the materials and finishes aren't as impressive as those in a 3 Series, however, and the Audi A3's cabin feels more special overall. Space is pretty good, although access to the rear seats could be better, and the boot is rather narrow. At 17,630 the 114i 3dr is the cheapest BMW you can buy, and costs just 335 more than the equivalent Volkswagen Golf 1.2 TSI 105. The entry-level Audi A3 costs 1575 more, but it has a 120bhp engine and it has the lowest contract hire rates of those three cars. Average economy of 49.6mpg means the 114i is thirstier than those rivals, too. In fact, it's no more fuel-efficient than the 116i, which has a 134bhp version of the same engine and can accelerate from 0-60mph 2.7 seconds quicker. As a result, we'd go for the 116i instead. Or, better still, an Audi A3.